Today’s moment was when David Wiesner, three time Caldecott Award winner, spoke to a group of fans. He shared his perspective on writing and illustrating. And, he took us through the process of writing his newest picture book, I GOT IT! Like many stories, I GOT IT! focuses on one moment in time which is stretched out across 32 pages. Pulled from his boyhood memories of playing baseball in the neighbor’s back yard, David illustrated the actual and imagined circumstances surrounding the moment when the smallest outfielder is confronted with a fly ball. Of course I picked up my own copy of I GOT IT! as well as a new copy of THE THREE PIGS. Along with most of my picture books, this one was left to a new teacher when I retired. But how many times do I have the opportunity to own a signed Caldecott Award winning picture book? Answer: Four to date. Among the many fans in attendance were three legendary Cincinnati illustrators, who agreed to stand for a photo. From left to right: Loren Long, David Wiesner, Will Hillenbrand, and C.F. Payne. Thanks to Joseph-Beth Booksellers for bringing another amazing author and illustrator to Cincinnati. Look up some of David’s other picture books in your local bookstore. Oh yeah, and that moment when I got my picture taken with David Wiesner! What do two bunnies and carrot, four kids and four toys, one toddler, a baby, a dog and his toys, one greedy ghost, and two brothers and one dinosaur all have in common? Their inability to share. Look at the book covers below. What else do all these stories have in common? The same title. But what’s more important is what makes them different. Let’s take a look at the uniqueness of these seemingly identical picture books. The theme of sharing is evident by the title and artwork on the covers, it’s what’s inside that makes these stories more unlike one another than simply the characters on the covers. Three out of five of the books are nearly wordless, meaning the illustrations carry the story. Luthardt‘s story comes in at 30 words and Jin‘s story is told in only 19 words. Both Luthardt and Jin are author/illustrators meaning the complete storytelling experience is their own. Everything the reader experiences is a result of their text and art. Which brings us to the only book which has a low word count and is illustrated by someone other than the author. Crum‘s story comes in at only 8 words, even fewer than the two author/illustrators. Several page spreads have no text at all. How is that accomplished? Art Notes! Much of the story is told to the illustrator, Barton, through art notes. Barton then uses those notes to guide but not dictate her work. Not only is this important for writers and artists, but also for parents and caregivers. When ‘reading’ these stories with young children, be sure to leave room for the child’s story and their own interpretation of the story on the page. Ask questions, allow them to discover meaning and thus ‘read’ it for themselves. The other two books are wordier. Heap‘s story is told in 224 words and Stein‘s story is told in a whopping 508 words. And contrary to popular opinion these are not the two oldest books, which generally have a higher word count than today’s books. Are non-illustrator authors dependent on more words to tell their stories? No, Heap is an author/illustrator, only Stein is an author only. Her story is illustrated by van Hout whose artwork adds whimsy and humor to the text. So, what about these stories with the same title makes them unique? They all discuss the theme of sharing but it’s how the theme is revealed that is unique. The low word count stories are targeted to a younger audience. In Crum‘s 8 word story a toddler of unidentified gender tries unsuccessfully to keep his toys away from a younger sibling but ends up losing all his toys to the dog. Jin‘s 19 word story replaces children with bunny rabbits who find one carrot, one top hat, and one very sad snowman. And Luthardt‘s 30 word story is about brothers who receive a stuffed dinosaur in the mail and end up ripping it in half before they learn that they need to share in order to play with their repaired gift. The two books with the higher word count are geared for a slightly older and more mature audience. Both main characters are of preschool or school age. Heap‘s 224 word story centers around an older friend or sibling who finds it hard to share with three other younger children. It’s not until she sees how sad the baby is not to have one of her toys that she learns to share. This added a layer of empathy is more appropriate for older readers. Stein‘s 508 word story features a greedy ghost who arriving in a new home, insists on claiming everything from the toast to the toys as his own. The older girl protagonist sees only the bright side of his greediness allowing him to have whatever he wants and finding something else for herself. When the ghost sees that she is happy with what she has, but doesn’t want to play with him, he learns to share so they can have fun together. The change in the ghost’s attitude actually turns him into a ghost that the owner of the mansion up the hill doesn’t recognize. This measurable character change is a sign of maturity the older reader is working toward. Same titles. Same theme. Different stories. This is truly an example of what your mother always taught you: Don’t judge a book by its cover. A lonely boy goes through life being teased and bullied. The bluebird befriends him and just when the boy starts to feel happiness he encounters fear and sadness in the park. 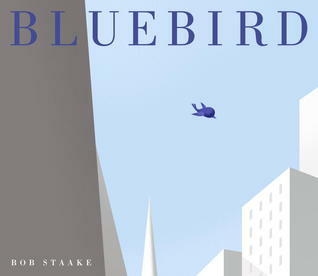 The bluebird, in an effort to distract the bullies, becomes injured – maybe even dying. The boy is overcome with guilt and heartbreak. Suddenly another bird appears, then another, and another. The redbird, and the yellow bird, and the green bird, and the other colored birds come and take the boy holding the bluebird into the sky. Above the city and above the clouds, the bluebird is rejuvenated and flies away in the heavens. Bob Staake tells this story and more without a single word. His masterful artwork speaks to the reader with descriptive scenes, actions, and most importantly feelings. The colors you see on the front cover are the only colors in the whole book until the end when birds of different colors come to lift the boy and bluebird into the sky. There is something about this book that tugs at your heart and soul. It begs to be read over and over. I can look at any spread and immediately be drawn into the story. I actually felt myself draw inward when the boy was being teased, and sigh with relief when he made friends with the children at the park, and tense when the bullies came out of the shadows, and rise when the birds carried the boy in the sky. In its quietude, it is a private story to be felt more than read, and Bob Staake was a genius not to let words interfere with the story.